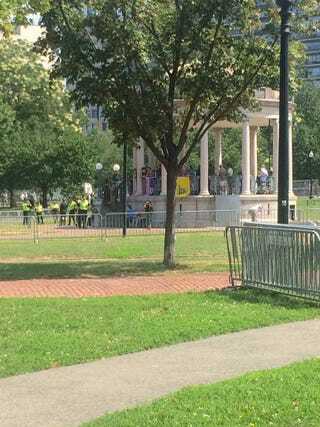 The intolerant can’t even fill the bandstand on Boston Common. No one showed with sound equipment. No organizers. They are whining on their FB event saying “where is everyone?” and “who organized this!” and “who is in charge?” while surrounded by a contingent of Boston police. Thousands fill the Common with signs of love, acceptance. The (let’s be honest) mostly white people who gathered in direct opposition to the Free Speech group talk about equity and showing that hate has no home in Boston. Meanwhile a large group of with many PoC lead by queer activists from BLM are faced with this while marching toward the Common. Photo stolen from TV grab by a friend. Another group of riot gear police have gathered at one area in the Common and are telling the peaceful protestors to leave/disperse. I’m not sure how this is going to be “sold” on the news tonight, likely it will depend on whether people leave easily/quickly and orderly but I will say that the Free Speech losers have left, they were coalescing at a nearby McDs for a while but I think they now left there, too.